Before even looking for your first house, you can get pre-qualified for a loan ensuring the rest of the process is hassle-free. Integrity Mortgage & Financial Inc. can help you get pre-qualified and on your way to home ownership! You’ve worked hard for years and now you’re ready to buy a home. That’s a big step in your life, and it comes with so many rewards and responsibilities. Before you start your house hunt you need to pre-qualify for a home loan. But, what does the bank need from a potential buyer to pre-qualify? Would you meet the standards for a loan? The bank is going to need to see your proof of income to see how much they can lend out to you. Investopedia also states they will need your proof of employment, too. But, what if you are self-employed? Or recently started a business that is growing and thriving? Many people are starting their own businesses these days and banks have taken notice of this trend. You can pre-qualify for a bank loan being self-employed. Nerd Wallet suggests keeping good records, separating your accounts properly, and registering your business. Bundrick also recommends working with a bank that puts a relationship with their clients front and center. Otherwise, you may be disqualified because you did not meet a rigid set of standards. Integrity Mortgage is willing to look at the big picture with its customers as our business model emphasizes relationships first. You’re first thought is probably ‘I’m trying to get pre-qualified for an asset, why do I need to prove my assets?’ That’s understandable. Banks want to see your assets to make sure you are liquid enough to cover the closing costs and down payment. Assets include things like your bank accounts, stocks and bonds, IRAs or 401(k)’s, and monetary gifts. Be sure to get these things together so the lender gets the full scope of your finances. You will want to run a copy of your credit reports before you begin the pre-approval process. There could be something on your credit report that slipped your mind that could prevent you from qualifying for a loan. You also want to make sure everything on there is accurate. If you see a discrepancy on your credit reports, then you need to clear those up promptly. You can run your credit reports for free once a year which is recommended whether you are actively seeking a loan or not. You want to nip any problems in the bud should they arise. Do you have a down payment saved up? Many think you must have a down payment before you can buy a house. That is not always the case. Having a down payment will decrease your mortgage insurance and interest rates. However, that does not mean you must have one to purchase a home. Use a mortgage calculator to determine what your monthly payments would be with and without a down payment and see what you can afford. Trying to figure out the best mortgage option can feel overwhelming. Talk to a trusted loan advisor at Integrity Mortgage. We explain all your options to you and help you make a choice that’s right for you. If you served in the military or are actively serving in the military, Integrity Mortgage’s VA loans are a great choice. These typically have more options included in them than traditional home loans. Even if you don’t qualify for more traditional loans you may qualify for a VA loan. These offer perks like no PMI, no money down, and the availability of jumbo loans. In fact, there are many great loan options out there. If you’re a first-time home buyer, see if you qualify for an FHA loan. Moving to the country? Consider the rural housing loans available in your area. Check out the qualifications for 15 year and 30 year fixed rate mortgages through Integrity. If you choose to re-finance down the road, these fixed-rate mortgages are a great option. If you are thinking about an adjustable rate mortgage, Fearless Homebuyer recommends careful examination of this one. The rates may be lower than average now, but that could change in a few years. Would you be able to afford the increased costs down the road? Whether it’s your first or fifth home, buying a home is a great experience. 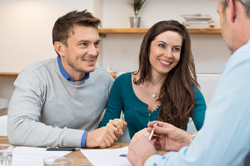 We know the loan process can seem overwhelming to the untrained eye. Let Integrity Mortgage and Financial Inc. help take you through the process. Customer service is at the core of our business, and we have a variety of loan options to suit your needs. Call us today.